Graduates, from left, Jeffrey Cechovic, Jacob Cameron, Cullen Friedrichsen and James Willis were treated Saturday at a graduartion banquet in recognition of their success as the second class to graduate from the Tyson Fresh Meats-DMACC One-Plus-Two Industrial Maintenance Program. Congratulating the graduates were, from left, Tyson Maintenance Training Supervisor Christopher Roberts, DMACC Continuing Education Coordinator Galen Briggs and Tyson Plant Engineer Randy Leesley, and graduating were, from left, Jacob Cameron, Jeffrey Cechovic, Cullen Friedrichsen and James Willis. 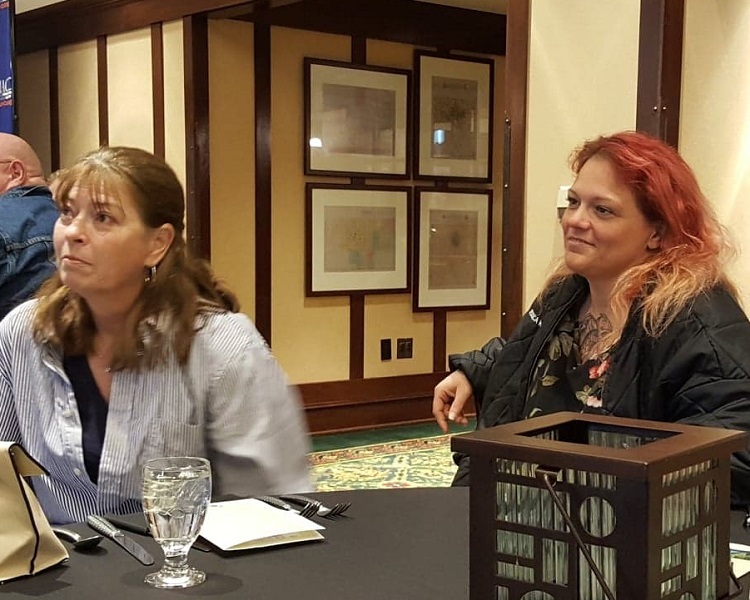 United Food and Commercial Workers Union representatives Jody Wells, left, and Jessica Khalid were special guests. Caught blinking in tandem, AmeriCorps Coordinator Susana Romero, left, and GEAR UP Coordinator Connie Saenz were special guests. Key Tyson players in teh One-Plus-Two Program were, from left, Tyson Plant Engineer Randy Leesley, Maintenance Training Supervisor Christopher Roberts and Human Resources Director Alberto Olguin. The Tyson Fresh Meats Inc. pork plant in Perry employs about 1,300 people. 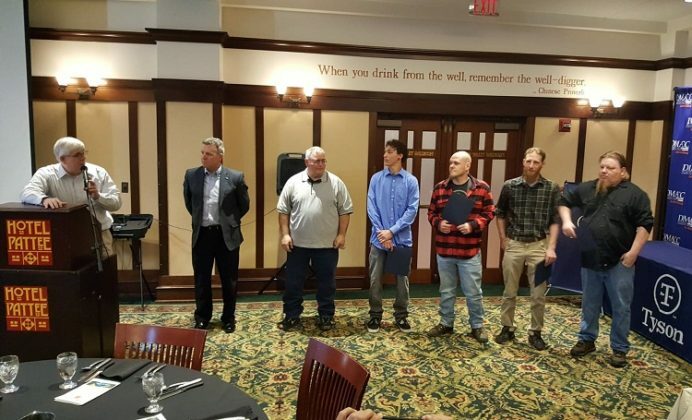 Four students were honored Saturday at a banquet at the Hotel Pattee as the second class to graduate from the Des Moines Area Community College VanKirk Career Academy and Tyson Fresh Meats Inc. partnership called the Industrial Maintenance One-Plus-Two Training Program. The graduates were Jacob Cameron, Jeffrey Cechovic, Cullen Friedrichsen and James Willis. 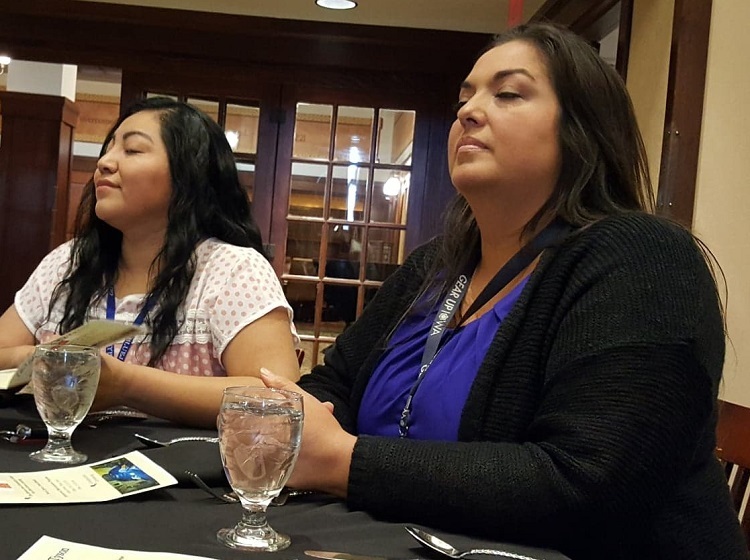 The grads and their families were treated to a banquet and ceremony at the Hotel Pattee in Perry. DMACC representatives joining the graduates and their families and friends for the midday meal were Continuing Education Executive Director Mike Hoffman, Continuing Education Coordinator Galen Briggs, Instructors Bob Hunt and Brett Brubake and Administrative Assistant Mary Ocker. 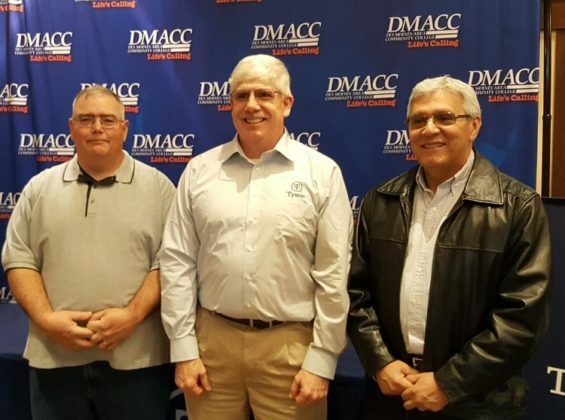 Representing Tyson Fresh Meats at the banquet were Plant Engineer Randy Leesley, Corporate Maintenance Training Manager Daniel Moreno, Human Resources Manager Alberto Olguin, Maintenance Training Supervisor Christopher Roberts and Chaplain Terry Wilkinson. United Food and Commercial Workers Union representatives attending the banquet were Jody Wells and Jessica Khalid, who was a member of the first graduating class in 2018. Connie Saenz of GEAR UP and Susana Romero of AmeriCorps were special guests. The PHS-based programs promote high school completion and career exploration. 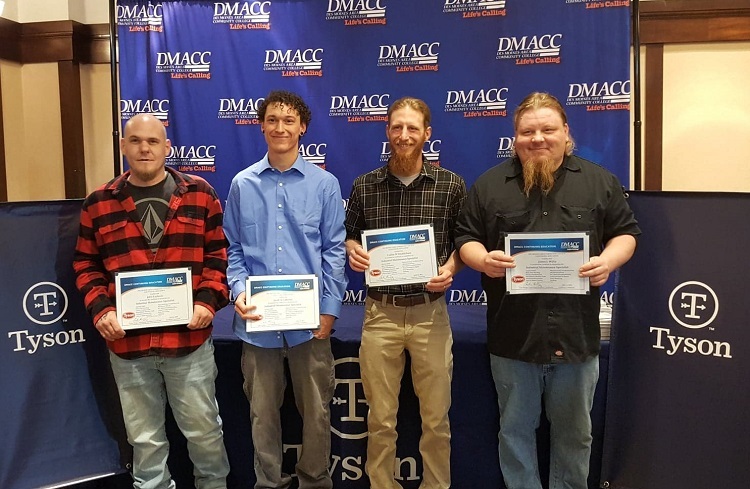 During their first year in the Industrial Maintenance One-Plus-Two Training Program, the student-workers took classes at the DMACC Perry Van Kirk Career Academy in the mornings and worked at the Tyson Fresh Meats plant in Perry in the afternoons and on Sundays. During the second and third years, employees will work full-time at the Tyson plant and then continue as full-time employees after graduation. The starting wage was $19 per hour, and the student-workers were paid for attending classes. In addition, a full benefit and insurance package will be available on the first Monday after two months of full-time employment. Tyson sank about $15,000 into the program partnership with DMACC, and both partners in the One-Plus-Two program came away with positive impressions. 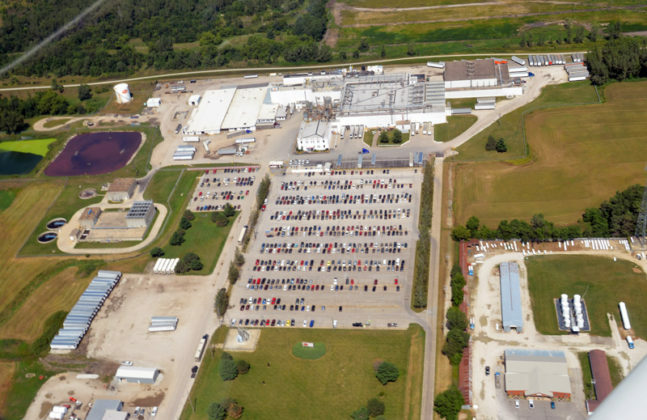 Tyson Fresh Meats Inc. employs about 1,300 people at its Perry plant. The Des Moines Area Community College serves nearly 60,000 students at 12 campuses around central Iowa. 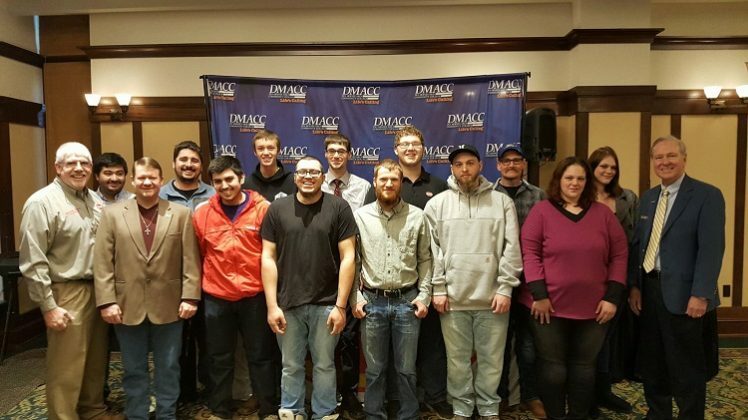 For more information about the Industrial Maintenance One-Plus-Two Training Program, contact the the Tyson Fresh Meats Employment Office at 13500 I Court in Perry. 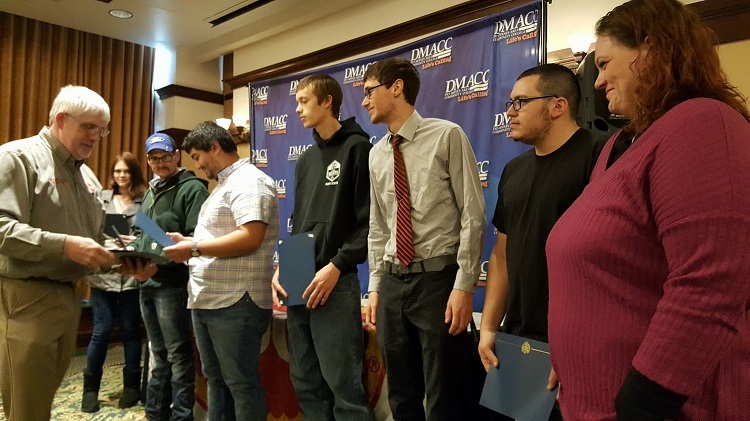 Tyson Maintenance Training Supervisor Christopher Roberts, left, gives certificates for near-perfect attendance in the program to students, from left, Courtney Wood, Brad Rice, Jacob Murillo, Gabriel Condie, Zak Olsen, Josh Castro-Fessler and Jessica Khalid. 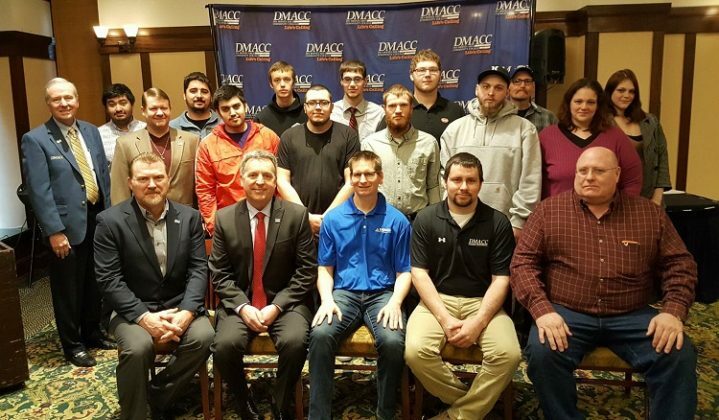 Celebrating the first graduating class of the DMACC-Tyson Industrial Maintenance Program Friday were, front row seated from left, DMACC Continuing Education Coordinator Galen Briggs, DMACC Continuing Education Executive Director Mike Hoffman, DMACC Business Resources Consultant Aaron Chittendon, DMACC Instructor Kyle Harding and DMACC Instructor Brett Brubaker; second row standing from left, DMACC President Rob Denson, Travis Johnson of Perry, Jonathan Najarro of Perry, Josh Castro-Fessler of Perry, Christopher Uss of Perry, Aaron McMenamin of Perry and Jessica Khalid of Perry; third row from left, Jacob Murillo of Perry, Gabriel Condie of Perry, Zak Olsen of Perry, Jason Woodworth of Perry, Dylan Davis of Grand Junction, Brad Rice of Rippey and Courtney Wood of Perry. Celebrating the first graduating class of the DMACC-Tyson Industrial Maintenance Program Friday were, front row from left, Tyson Maintenance Training Supervisor Christopher Roberts, Travis Johnson of Perry, Jonathan Najarro of Perry, Josh Castro-Fessler of Perry, Christopher Uss of Perry, Aaron McMenamin of Perry, Jessica Khalid of Perry and Des Moines Area Community College President Rob Denson; second row from left, Jacob Murillo of Perry, Gabriel Condie of Perry, Zak Olsen of Perry, Jason Woodworth of Perry, Dylan Davis of Grand Junction, Brad Rice of Rippey and Courtney Wood of Perry.